International Coalition of Apostles was initated at a meeting in Singapore in 1999 when the Argentinian Ed Silvoso presented the vision to Dr. C. Peter Wagner and several other global apostles who were assembled, such as Lawrence Khong (Singapore), Estavam Hernandez (Brazil), and Harold Caballeros (Guatemala). The vision was to bring together the perspectives, experience and resources of global apostles to enhance the transformation of society and propagation of the gospel. The first Presiding Apostle of ICA was C. Peter Wagner (1999-2010). 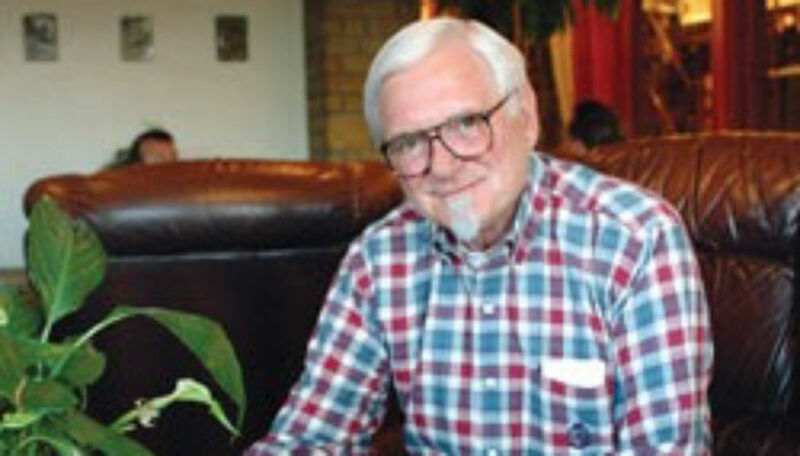 While Wagner was the Presiding Apostle of the International Coalition of Apostles (ICA), he was simultaneously Convening Apostle of the New Apostolic Roundtable (NAR), which had among its members Chuck Pierce, Ché Ahn, Harold Caballeros, Emmanuele Cannistraci, Naomi Dowdy, John Eckhardt, Bill Hamon, John P. Kelly, Lawrence Kennedy, Lawrence Khong, David Kwang-Shin Kim, Larry Kreider, Roberts Liardon, Dexter Low, Mel Mullen, Alistair Petrie and Eddie Villanueva. (Ministries Today Magazine, July-August 2000). «The International Coalition of Apostles (ICA) provides my broadest apostolic relationships», wrote Wagner in his 2010 autobiography (Wagner, C.P. Wrestling with Alligators, Prophets and Theologians. Lessons from a Lifetime in the Church. Regal 2010). 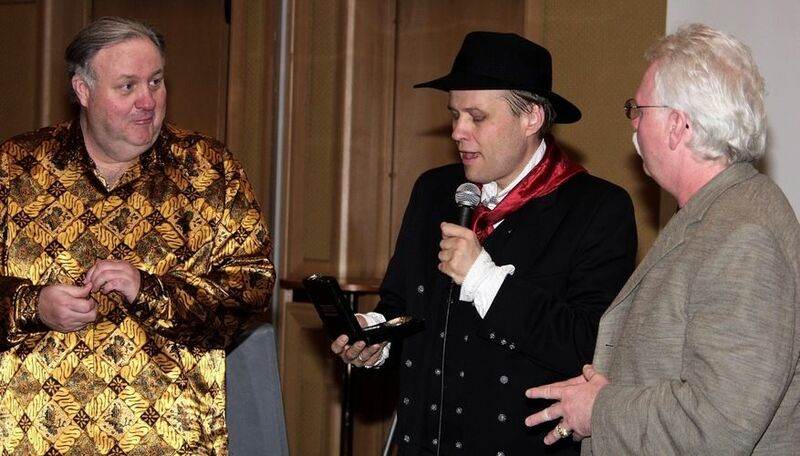 Jan-Aage Torp thanking John P. Kelly and Chuck Pierce for their ministry at an apostolic conference in Oslo in 2003. Both Kelly and Pierce were an integral part of Peter Wagner´s ICA leadership core team. When International Coalition of Apostles (ICA) was conceived in 1999 in Singapore, it was truly global. The group of apostles gathered to discuss how God could use the combined efforts of global apostolic leadership to advance the Kingdom of God more rapidly and effectively. A wide array of apostles from various streams, continents and nations, decided that such a coalition was needed. Among the founding members were men and women from Singapore, Malaysia, Indonesia, Australia, New Zealand, South Africa, Great Britain, Guatemala, Brazil, Argentina, Mexico, Canada and USA. Under C. Peter Wagner´s Presidency, ICA was a decentralized structure with each national and regional coalition worldwide being autonomous, yet interconnected with ICA through relationship and honor. Wagner´s advice was readily sought worldwide. Samuel Lee, Stanley Hofwijks and Jan-Aage Torp at a Dutch Network of Apostles (DNA) meeting in Amsterdam 2007, hosted by Dr. Lee, who is a friend of Jan-Aage Torp and EAL, but not a member. In August 2010, C. Peter Wagner handed his various ministries to several spiritual sons and daughters. Most significantly, he handed his main structure, Global Harvest, to Chuck Pierce who restructured it under the name Global Spheres as a new wineskin to empower new generations of apostolic leaders, with Wagner as a Vice-President. 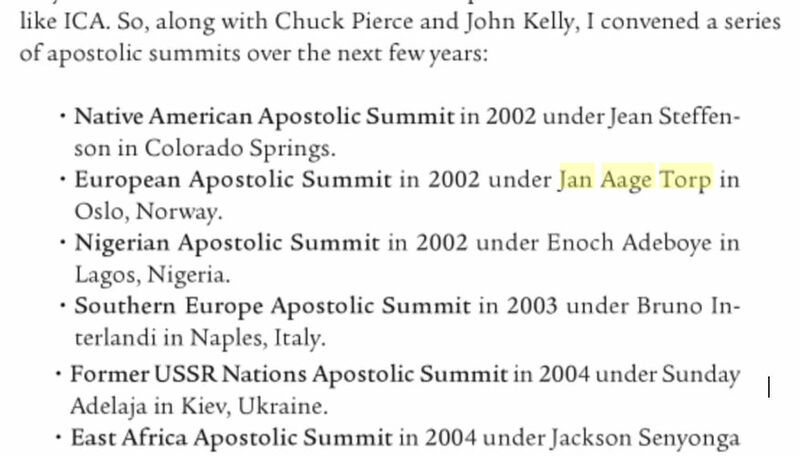 ICA was handed to John P. Kelly who in 2013 changed the name to International Coalition of Apostolic Leaders (ICAL). Under Kelly´s leadership, there has been an effort to make ICAL a centralized organization with all major decisions made at his office in Texas. From 2001 onwards, serious attempts were made to establish an international structure for ICA. Continental and sub-continental summits were held. A continental structure was formed in Europe, whereas national structures were formed in nations as diverse as Nigeria and the Netherlands. Even though the ICA Presiding, Executive and Ambassadorial apostles were involved in the processes leading to the establishment of such entities, no overriding structure was ever intended. Each coalition became a separate entity, but connected with each other through love, honor, communication and collaborative efforts. A European Summit was held by ICA on May 14th-16th, 2002 in Hamar, Norway with 38 European apostles from 18 European nations, assembled and convened by C. Peter Wagner and Jan-Aage Torp. Samuel Lee (Netherlands), Wieslaw Ziemba (Poland) and Jan-Aage Torp (Norway) were among the participants at the historic ICA Europe gathering in Norway 2002. Now, in 2016, they were reunited at the EAL gathering in Oslo. 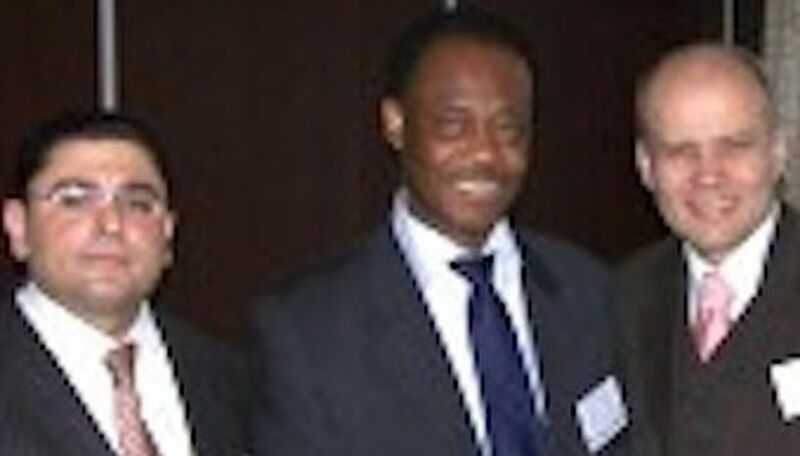 Afterwards, the ICA leadership in USA gave the mandate to lead the continuing efforts in Europe to George Bakalov, who gave it the name European League of Apostles at a meeting that he called in The Hague, Netherlands in November 2002. These efforts were aborted in 2004. Official ICA European Summits were held in 2003 in Naples, Italy for Southern Europe and in 2004 in Kiev, Ukraine for the former USSR nations. ]In May 2005, the first ICA-related national initiative was established in the Netherlands under the name Dutch Network of Apostles (DNA) with Dr. Samuel Lee as the Presiding Apostle. Twice a year, gatherings were held that assembled apostolic leaders from all over the Netherlands: 2006 report. 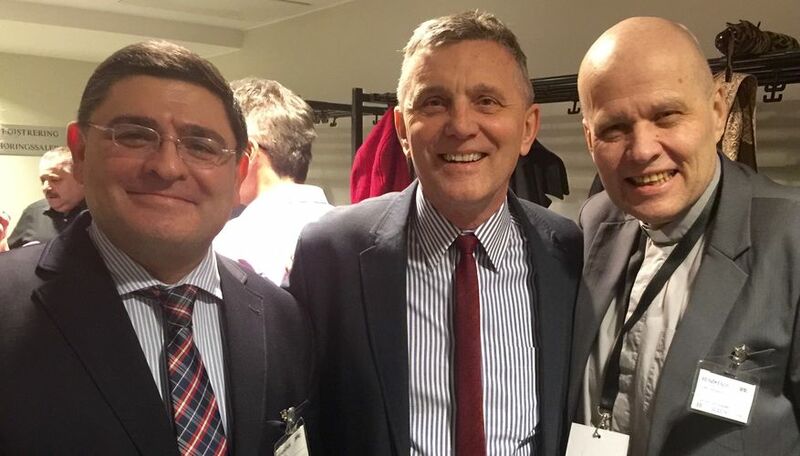 On June 1st, 2012, Jan-Aage Torp initiated an informal Norwegian relational structure of apostolic leaders, which was extended to several leaders in Northern Europe during the ensuing 12 months. On May 23rd, 2013, Jan-Aage & his wife Aina established the association Apostolicleaders, registered in Norway, to serve as the structure of the emerging European apotolic movement. On June 26th, 2013, the International Council of ICA appointed Jan-Aage Torp as the first Convening Apostle of ICA Europe with «the purpose to facilitate and encourage the development of emerging, viable national coalitions, while simultaneously serving apostles in Europe as a whole with their vibrant regional identity» (letter to European ICA members on July 16th, 2013). At first we were named ICA Europe, but we coined the name European Coalition of Apostles (ECA) on July 16th, which became European Coalition of Apostolic Leaders (ECAL) on November 13th. After a formal separation from ICAL on November 13th, 2015, we changed our name to European Apostolic Leaders (EAL), which is registered in Norway. 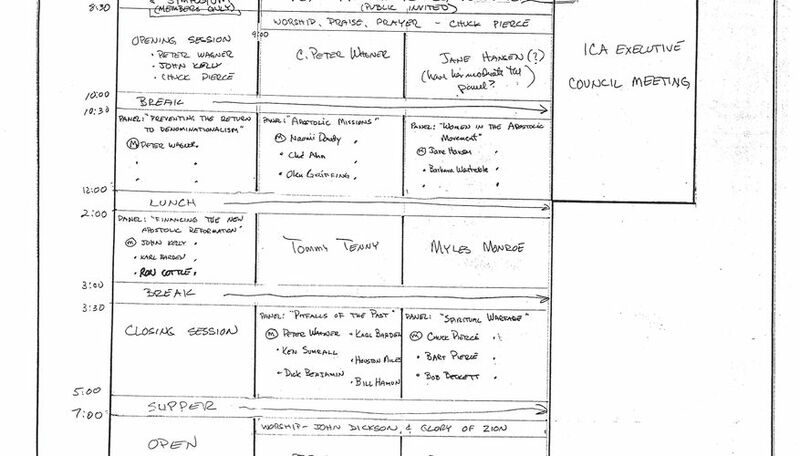 2000-12 Peter Wagner´s handwritten notes for the schedule of the first ICA Annual Gathering in Shady Grove Church, Dallas-Fort Worth, Texas. C. Peter Wagner describes in his 2010 autobiography how an international structure was established in ICA(L) in 2002 and onwards (Wagner, C.P. Wrestling with Alligators, Prophets and Theologians. Lessons from a Lifetime in the Church. Regal 2010). 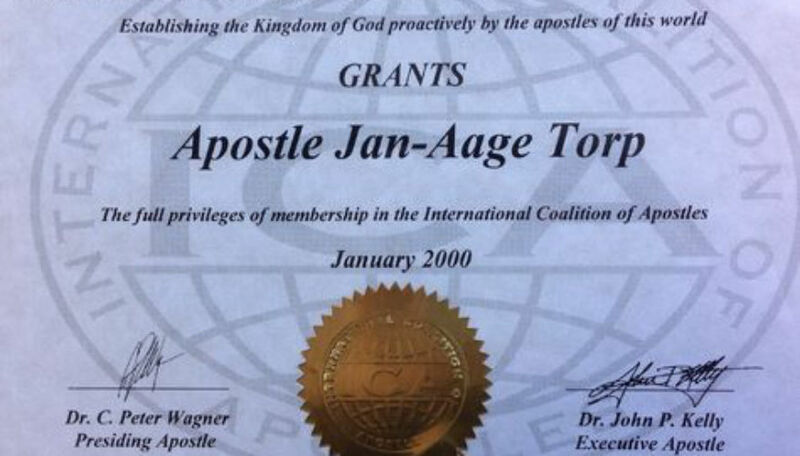 The leadership of ICA in January 2000, which was the beginning, is clearly documented in the certificate that was given to Jan-Aage Torp: Peter Wagner was the Presiding Apostle, and John Kelly the Executive Apostle.